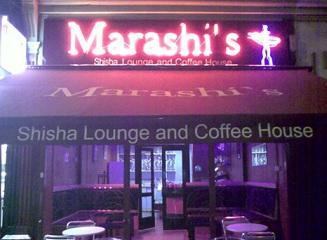 This trendy shisha bar / late night coffee house is located in Balham / Tooting (just by Tooting Bec Underground), and is becoming an ever increasing popular hangout. With cool decoration, mood lighting, music and TV, this spot is great for a fun, relaxing and social night out, and makes a difference to just spending an evening sat in a pub! They have a huge variety of shisha tobacco flavours, serve great Coffee and Tea, and even make custom milkshakes blended from your choice of chocolate bar! They also have an assortment of treats and snacks! Marashi's is open till late seven days a week, provide excellent friendly customer service, plus there's ample parking too!